Upon arrival we were quickly ushered to the bar where Laura swooned over the gin infusion station (and of course promptly ordered a gin). It's like pick and mix for grown ups - once you've got your beverage in hand, you are free to select your own garnish... and there were an abundance of things to choose from, from the standard lemons, limes and mint leaves, to exotic lychees, kiwi slices and goji berries. A BRILLIANT idea on a calm night filled with polite media and blogger types, how this will pan out on a busy weekend is yet to be discovered, but hey, we had fun. Worth noting that the bar staff were confident in suggesting recommendations, too, which was a definite bonus. Kirkstall Brewery Virtuous IPA was the only "craft" keg beer on offer at the time of our visit, although there was a cask line ready to be used (and a cask of Abbeydale Moonshine waiting in the cellar). So despite it not being a beer focused venue, it was really nice to see that there was at least a local and an independent offering. 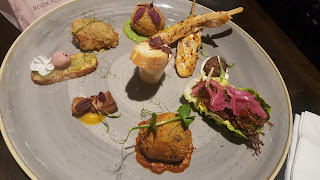 A selection of canapes was brought over whilst we imbibed, which were all delicious and the first indication that we'd perhaps underestimated the menu we were to be treated to, having expected a more "pub grub" offering. 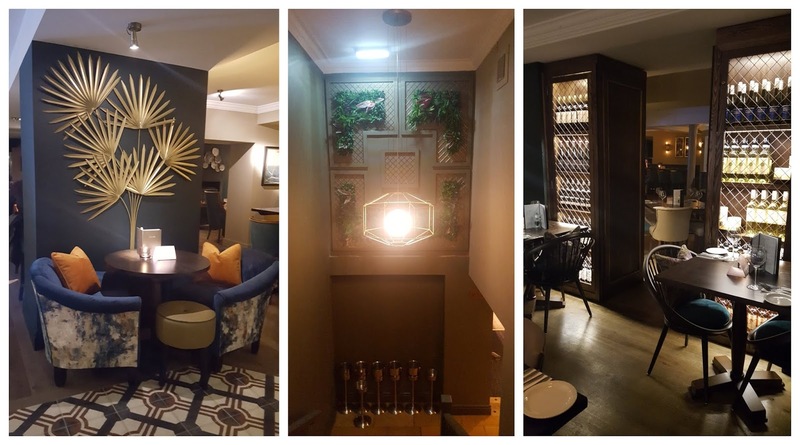 The words "gastro pub" and "elevated" are terms I'm not hugely keen on but it's fair to say that the food the Prince of Wales has gone for is certainly more of a style you'd expect in a fine dining restaurant. Highlights were the delicately spiced and fragrant lamb koftas served with coconut tzatziki, and crispy chilli beef with little pickled onions. Following our nibble platter we were ushered into the dining area for our main meal. The space is large but still manages to retain a cosy feel and I liked that our table had a view of the kitchen pass - our only criticism being that the "mood lighting" made it a tad tricky to properly see what we were eating and meant we had to turn the flash on our phones as a makeshift torch to get decent photos. Ah, blogger life. 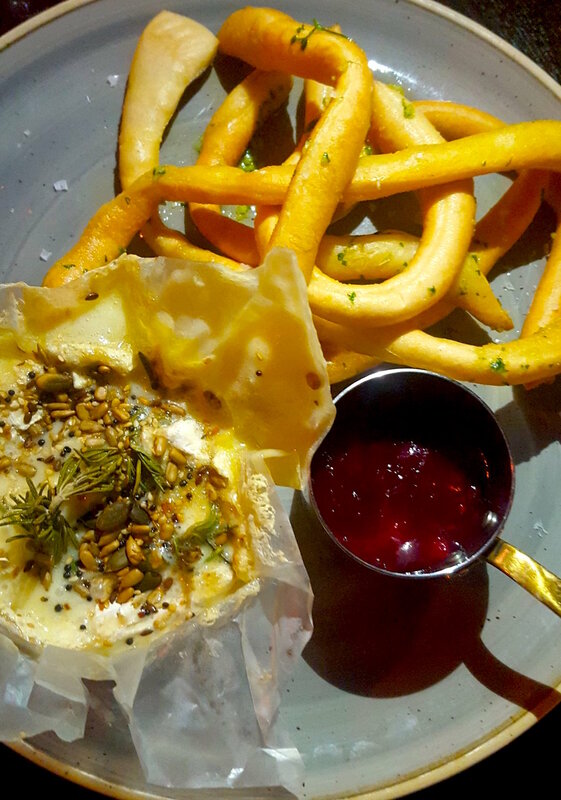 Our starter was a great big dollop of cheese - an unctuous, creamy baked camembert, to be precise, served with (slightly oily, but yummy) dough sticks and sharp cranberry dip. You can't really go wrong with cheese and this was a total oozy, messy treat. 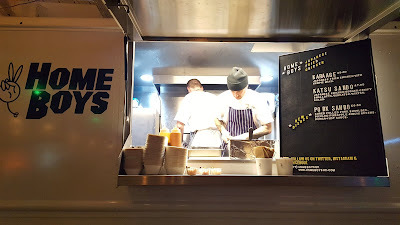 The main menu offered up a selection of the usual suspects, pizzas, steaks, and burgers, all of which were presented with a little more refinement than the standard pub output. For example, in the case of the Wagyu beef burger (already an upgrade on the standard house burger) half a lobster can be added to the side for those inclined to such things. We eventually selected the chorizo, crab and king prawn linguini, and the roasted pork belly with scallops. Both dishes were beautifully cooked and the scallops were incredible - wonderfully buttery, with a slight bite and perfectly placed within the dish. Great wine selection to go with it all, too. Desserts were a bit more of a mixed bag - the brownie and chocolate pudding were both tasty but a little on the stodgy side, but the melting chocolate bomb was sensational in looks as well as flavour and Laura had the best Cointreau hot chocolate she reports to have EVER had, not words she uses lightly. 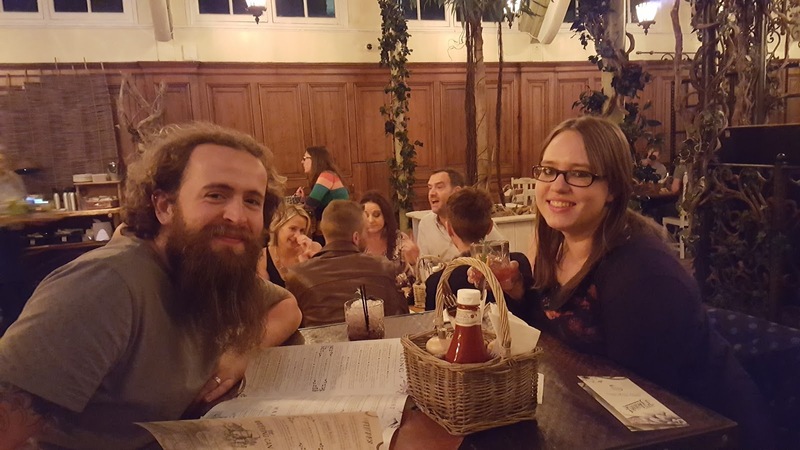 Being completely honest here, it's not the type of place we would usually choose to eat out - owned by one of the big pub chains, we were expecting a relatively straightforward food offering and a not-particularly-exciting drinks selection. 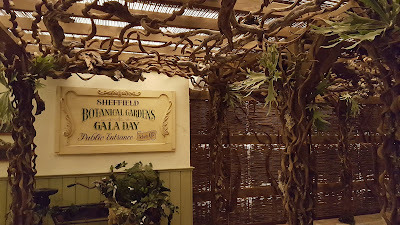 However, we'd definitely set our expectations far too low, and were surprised in a very good way at what a brilliant evening we'd experienced. 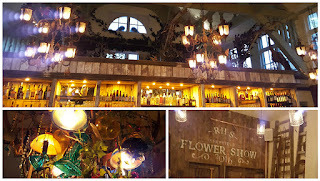 It's definitely somewhere we would go again, and both commented that it'd be a great place for our family members that like to go somewhere formal as opposed to uppity (again, not normally a vibe we go for when dining as a duo!) for a special occasion. 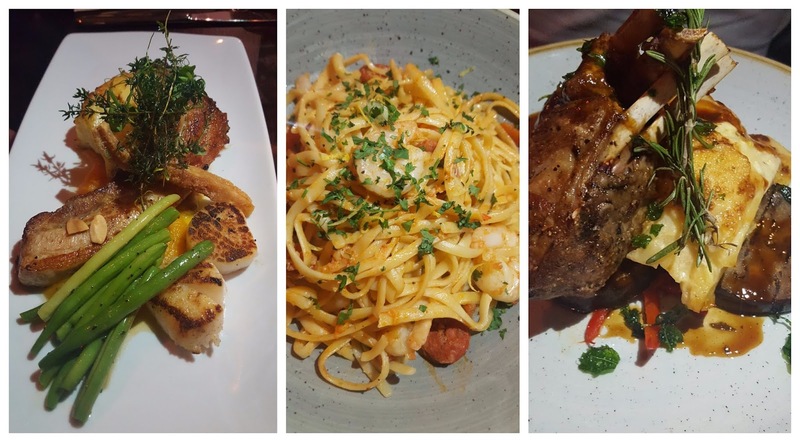 The food and drinks are a little pricier than we'd generally spend hence a sense of occasion being necessary, but the value for money we reckon is still there. If you'd like to know more, head to the Prince of Wales' website where you can also view all of their menus in full. Disclaimer: We were provided with a meal and associated drinks free of charge in exchange for a review. However, this has not affected our opinions, which as always are completely honest and all our own. It was the height of the summer heatwave when the sweltering upstairs room of the Rutland Arms played host to David from the Isle of Arran Distillery and Sam from Indie Brands, a distributor focusing on a portfolio of spirits and cocktail producers from around the world, in an evening organised by our favourite spirits shop Starmore Boss. We opened with the flagship release, the Arran 10 year old, while we were shown a short video about the distillery, based near the village of Lochranza on the north tip of the Isle of Arran (We visited in 2015). The whisky itself has a smooth sweetness with heaps of vanilla and a little touch of white chocolate, that continues across the palate with apples and custard. The bourbon influence is massive, and we all agreed this was a great way to open the evening and an excellent choice for those not already familiar with the distillery to get a clear idea of its character from the off. The next dram was a big step in age to the 18 year old release, which is delightfully refined. Finished in sherry casks to help round the flavours and add a wonderful punch of sticky dried fruits, raisins, prunes and a little cherry, bolstering the overall profile which holds a delicious dark chocolate character. The whole thing comes together in a way very much reminiscent of Rocky Road. 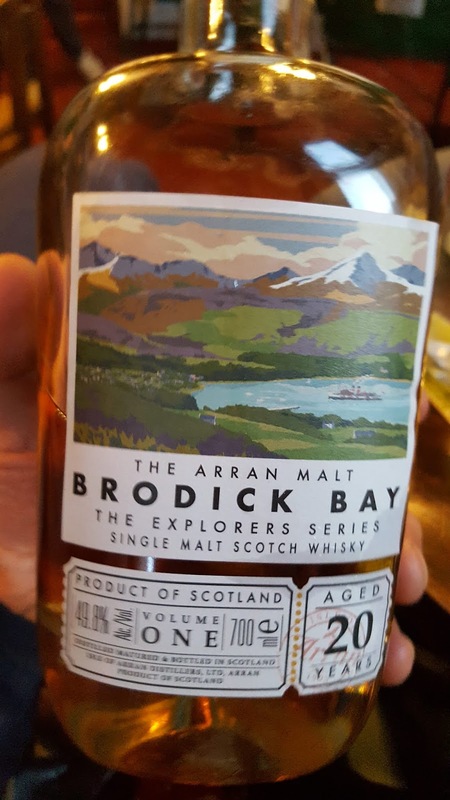 The brand new release Brodick Bay followed, the oldest of the evening at 20 years old and one of the most accomplished. The distillery itself being only 23 years old, to have the quality of spirit to release a drink as defined as this one is a monumental feat. This particular release is limited to 9000 bottles and bottled at cask strength of 49.8%. It has been aged for 8 years in ex-bourbon Buffalo Trace casks and sherry hogsheads before being blended and finished in Oloroso sherry casks. The palate holds plenty of dry sherry, but still loads of dried stone fruits, a little touch of spice and perhaps a little cinnamon. The wood character is clear and bold and really transfers a lot of the quality of the wood into the enjoyment of the spirit. The Amarone is a whisky we've drunk before in the distillery, so there are more detailled notes here. It was interesting to drink this in such a different context, from the cooling winds of the Irish Sea to the sticky stillness of summer time UK '18. This was cleverly paired with a chunk of dark chocolate also made on Arran. The addition of a rich, bitter flavour really opened up some of the finer points of the dram and enhanced the sweeter underrepresented aspects of the whisky, simply wonderful. 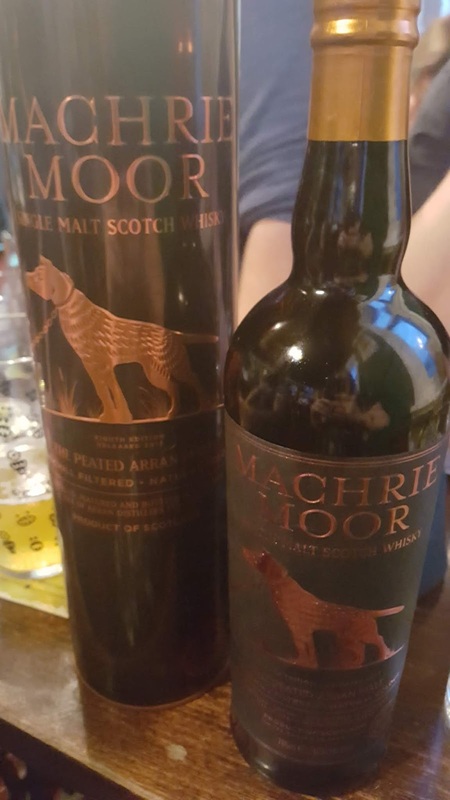 The final whisky of the night was Machrie Moor, a NAS peated whisky, that is perfect for those unsure of their peat reek limits - soft and rounded with just a little sweetness, not too much in the way of high alcohols, merely a warmth that comes from its slightly younger age. A very accessible dram. 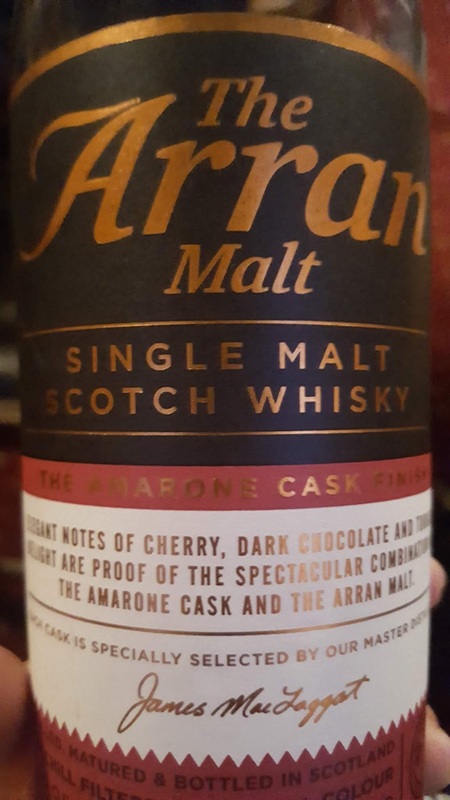 What really excites us about Arran is the ongoing construction of their second distillery, in which they will focus on producing only peated malt throughout. Although it's going to be a few years in the making, it's definitely one we'll be keeping an eye on and we're looking forward to following their progress. A big thanks to the Arran team for a well curated selection of drams, to Jeff from Starmore Boss for organising the evening and inviting us along, and to the Rutland for always being top notch hosts. I'll be honest, my gin collection is starting to get a tad out of control. I used to think gin was just gin - a simple spirit, with little to distinguish one brand from another. This assumption is increasingly wrong in a market which is continually improving, with a greater variety of different distillers producing gins which are carefully thought out, innovative and ultimately delicious. 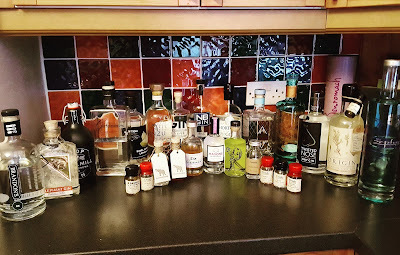 It's upon drinking them neat that the nuances of flavour can be picked out and pondered upon, but many of the gins on my shelves lend themselves equally well to cocktails, with the characteristics of each neat gin determining the additional components I like to try alongside them. Here are a few of my current favourites. A Craft Gin Club discovery, NB Gin hails from East Lothian, Scotland. Neat, it's very balanced and a beautifully classic London Dry style gin, however at 57%, although it remains smooth and has a good burst of citrus, the strength is a little too apparent for me to appreciate the gin fully without a lot of ice (which helps to open out the flavours) and a lemon twist for garnish. Craft Gin Club labelled this the perfect gin to make into a martini, and who am I to argue with perfection?! 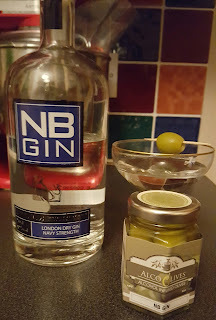 To a very cold glass (this is important), pour a double measure of NB Navy Strength, add 10ml of extra dry vermouth, stir and garnish with an olive - simple as that, but so much more complex on the palate than it is to make. My olive garnish was another item from my Craft Gin Club box - Alco Olives, themselves infused with NB Gin! Overall, I'd say this is a heavyweight gin which although tasty gains greater balance and drinkability from a cocktail. I absolutely adore this gin. The first time I tried it (in the Devonshire Cat in Sheffield, which has an excellent gin menu), it absolutely blew me away with a massive hit of what I perceived as bubblegum flavour - something I've never experienced before in a gin! According to the Sibling team (actual siblings themselves!) it's quite common for people to pick up on bubblegum notes from the blueberries used as one of the botanicals. It's got a gorgeous, very slightly earthy, fruity edge to it and it's so unusual. Highly recommended. In a cocktail, I thought I'd play more on the blueberry elements within the drink and stirred the gin down with a small spoonful of blueberry jam and a squeeze of fresh lemon juice, before topping up with prosecco. Decadent and delicious. 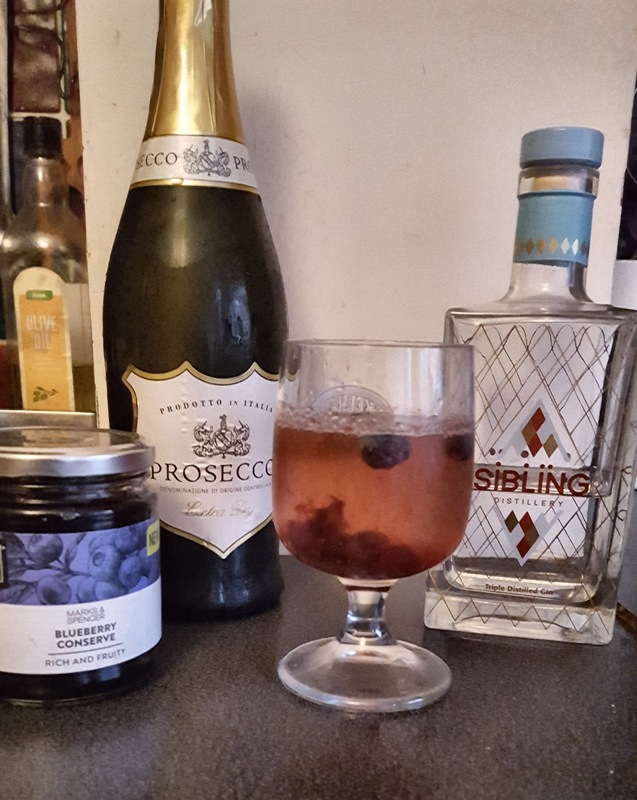 This gin also makes a beautiful G&T, with Fever Tree tonic and a few blueberries to garnish. Our most local gin! Based just a ten minute walk away from our house, we absolutely love this gin and the folks who run it are fantastic as well. The gin neat is light and zesty, with a slightly floral aroma and an incredibly smooth, balanced palate bursting with fruity citrus. 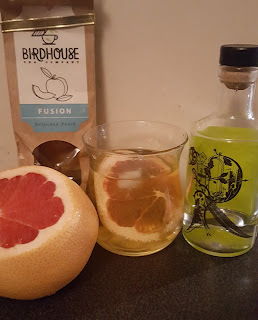 For the cocktail, I decided to use an ingredient from another of our local favourites - Birdhouse Tea Co. The citrus and grapefruit notes in the gin I felt would work really well with peach flavours, so I iced a cup of my favourite Princess Peach sencha green tea and added a good splash of Locksley gin. The cocktail was finished off with a squeeze of lemon juice, a tiny splash of sugar syrup (to taste, my friend preferred it without the additional sweetness) and garnished with a piece of pink grapefruit. 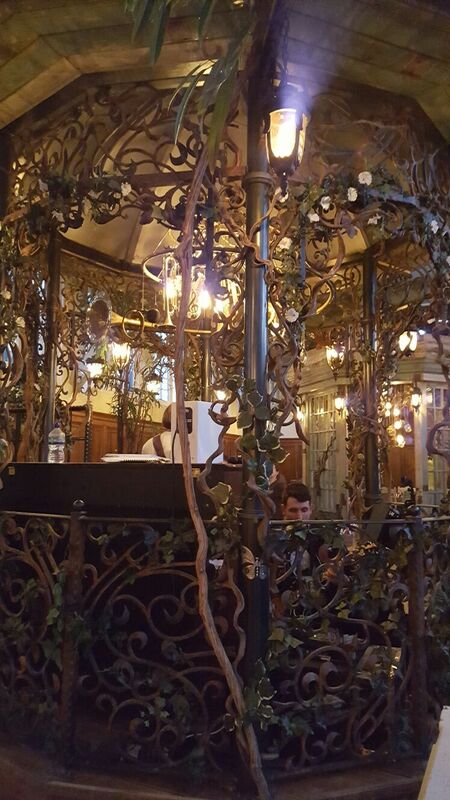 As an aside, Birdhouse have just opened their own tearoom, bar and restaurant and it is STUNNING. 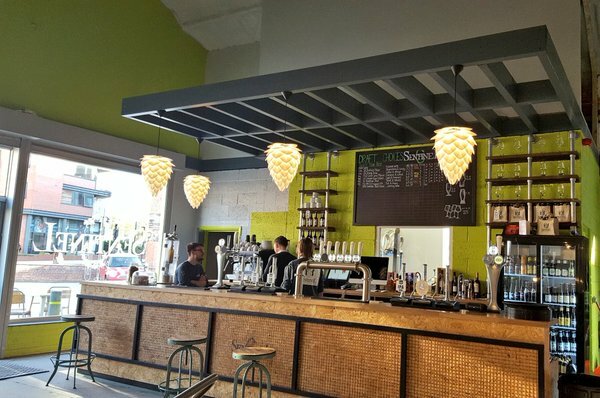 Sheffield, pay attention - they have a tea cocktail menu too! An American gin for my final choice - this one hails from Rocktown Distillery in Arkansas. This one was recommended to us by the fantastic Starmore Boss, one of our local booze purveyors and without a shadow of a doubt the most knowledgeable. Neat, it's crisp, fresh and almost a little creamy on the palate, with a beautiful honeyed character for an almost silky finish. For a cocktail, we chose a Souped Up Negroni. Now, the classic gin, vermouth and Campari mixture is boozy as hell as is. 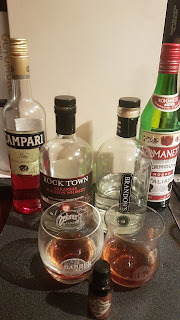 But I couldn't pass up the opportunity to mix up the Brandon's with the bourbon from the same distillery - a Negroni/Boulevardier hybrid, if you will. We mixed a shot each of the bourbon and gin with half a shot of red vermouth and Campari. The result was bitter, ridiculously boozy and very grown up, full of Seville oranges with an oaky backbone from the whiskey which helps set it apart from your standard Negroni. Not one for the faint hearted, but definitely and defiantly delicious. 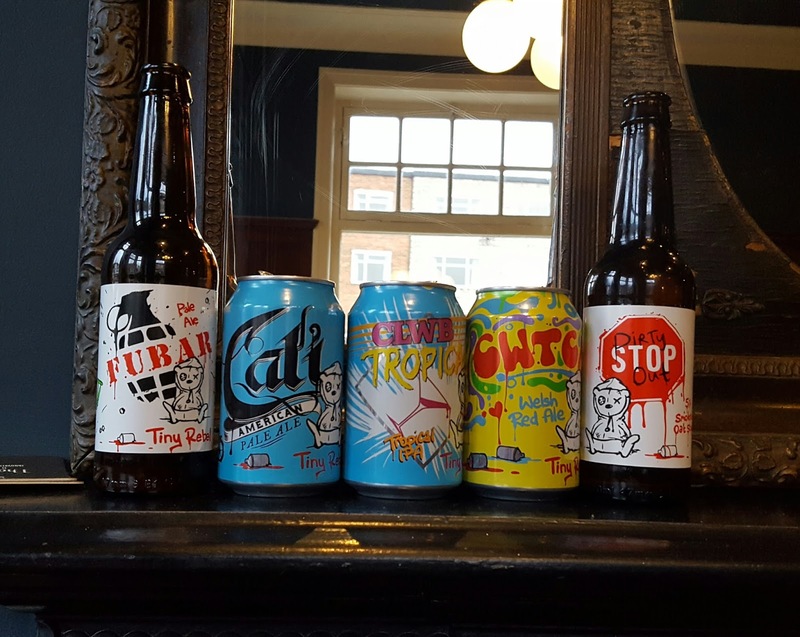 A relatively quiet start to the week for us as we joined in a twitter hour with @catsontap. We've long been fans of beercats Rosie and Milly, and our Tosin is a regular on their page too! 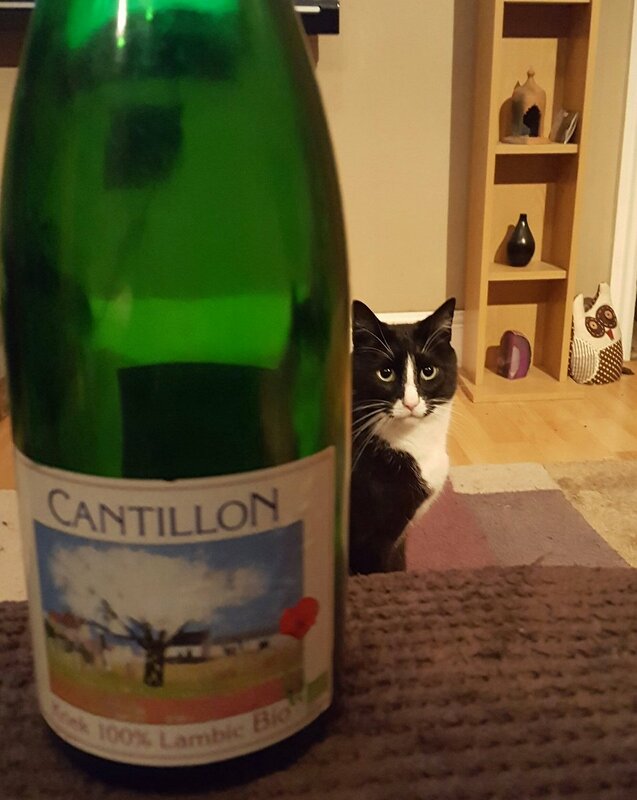 We kicked off with something pretty special brought back from our trip to Brussels last year - Cantillon Kriek 100% Lambic Bio. Face-puckering, fruity and a glorious treat to kick off the week. We also imbibed Cloudwater's Seguin Biere Brut, reminiscent more of a wine than a beer and utterly delicious. 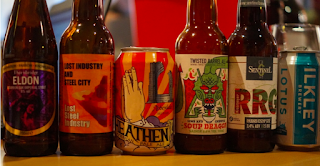 Every week, Sentinel Brew Co host a film night, wittily titled Brew-vie Tuesdays. We've not made it down to this before but in conjunction with Sheffield Beer Week they decided to show "Beertickers: Beyond the Ale". Filmed in 2008 in and around Sheffield, it was so entertaining for us to look back at the beer scene as it was around the time we both first properly got into real ale, with many a familiar face amongst the footage! Great pizzas and popcorn, too. 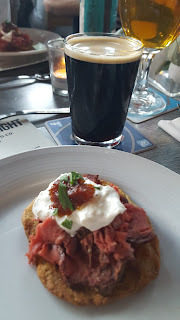 A Lervig tap takeover at the Rutland Arms kicked off our evening, with the highlight being Sippin' Into Darkness, a chocolate martini imperial stout at 12%. Bold, boozy and tasted like a Double Decker chocolate bar fondue. We then headed up to Brewdog for the Mad Hatter meet the brewer event and bumped into the team from Weird Beard. Plenty of beery chat and a lot of laughs were had. An even bigger night for us on the Thursday. 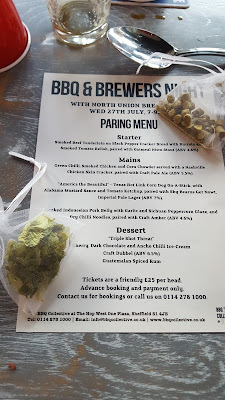 First off we hit up the Beer Engine's North vs South beer and food pairing, featuring four beers each from London based Fourpure and Fierce from Aberdeen. The food at the Beer Engine is some of the best in Sheffield as far as we're concerned, and a new guest chef brought in to create the pairing menus for this event elevated the offering to an even higher level. The highlight for us was Fierce's Tropical Tart, a beautifully light and tangy passionfruit sour, served with spicy prawns and crab laksa. 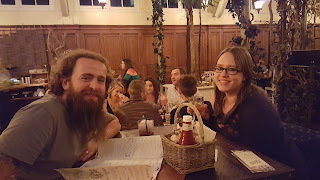 Finally we headed up to the launch of Abbeydale Brewery's new Brewers Emporium range at the newly refurbished Devonshire Cat, which was buzzing with a vibrant atmosphere and presented a great range of progressive beers to choose from. We started the day with a Beer Writers Breakfast hosted by the The Can Makers, giving us an insight into a truly up and coming portion of the market and with tasty pastries from Sheffield based Percy & Lily's. It was the first day of the Beer Now conference, ending with a trip to Beer Alive festival. It was the third time we've attended the festival and it's been scaled down pretty drastically this year. It's a shame that this resulted in a rather lacklustre beer selection - the lack of involvement from brewers directly, which was a great feature of last year's festival, was missed. A full on and inspiring day at the Beer Now conference, kicking off with Bob Pease of the Brewer's Association, who gave us useful insights into the American beer scene. Our favourite part of the day was undoubtedly the Live Beer Blogging featuring beers from Abbeydale, Ilkley, Lost Industry, Sentinel, Sharps, Thornbridge and Twisted Barrel - a frenzied hour of tweeting, chatting, learning and drinking. A raucous coach journey later and we were treated to BBQ and beers at Thornbridge Brewery, a brilliant evening where we also discovered that table football is never going to be our forte! 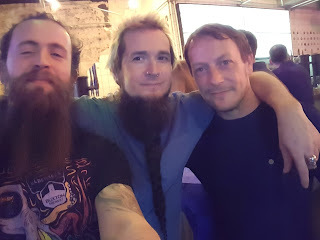 The Beer Now conference was wrapped up, with inspirational talks from Richard of Ferment magazine, Jules of Hop Hideout and of course Sheffield Beer Week fame, and Andy from the excellent Elusive Brewing. 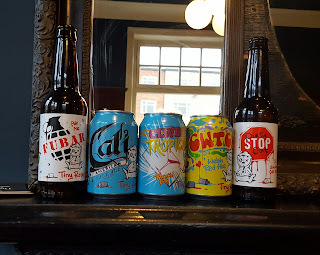 FINALLY, we trekked up to the Greystones for a special edition of Karma Citra, pairing a selection of Tiny Rebel beers with some super spicy Caribbean food. Always a brilliant event and a fun and laid back end to a very hectic week. To finish, it's worth mentioning that our festivities during the week didn't even scratch the surface in terms of the amount of events running. We really were spoilt for choice, and have been left feeling very lucky to live in a city with such a thriving, varied and exciting beer scene. A mighty round of applause to Jules Gray for co-ordinating everything... we're already looking forward to finding out what Sheffield Beer Week 2018 will bring! But first, a lie in and a green smoothie are most definitely in order. We love living in Sheffield... in fact, there's nowhere else in the UK we'd rather be! However, we have often lamented that the city centre pretty much closes down as soon as the clock strikes 5. In step Alive After Five - a new project helping our hometown to find out exactly what there is to offer once work is over, and to encourage more people to get off their sofas and out into town! The Alive After Five team invited us down to the inaugural Street Food Warehouse event, based on Trafalgar Street in the city centre. We've been a number of times to other street food markets, but although we've enjoyed them, it's definitely the case that they seem to have become victims of their own popularity, with massive queues and a tendency to invite back the same group of traders time after time meaning these events had lost a bit of the "je ne sais quoi" vibe for us, so we were looking forward to trying out an alternative. First thoughts - Trafalgar Warehouse was WAY nicer than we were expecting, having only really frequented the area to go to our most beloved but highly sticky, depraved and GREAT nightclub Corporation, which shares an outdoor area with the warehouse. There was an excellent mix of food offerings available, from waffles and brownies to hot dogs and pies. An on-site bar was also available serving beers from The Brew Foundation alongside a selection of wines, cider and soft drinks. Our first stop was Dim Sum Su, a trader who we were already familiar with but whose food never disappoints. 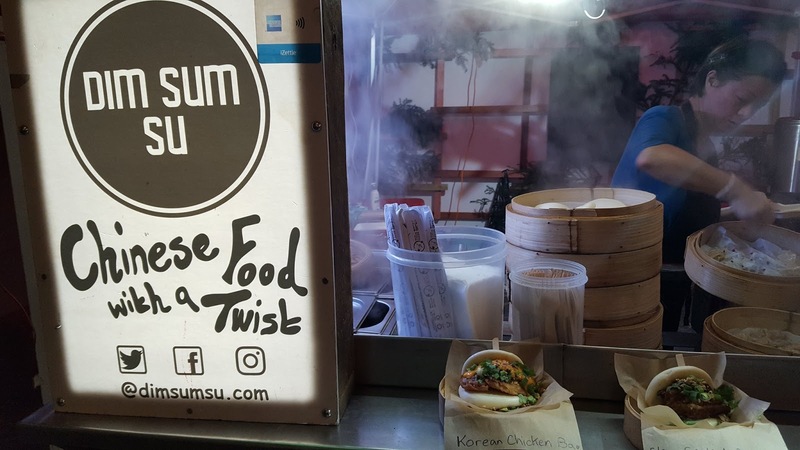 We were shown how the steamed buns are made and sampled the belly pork Bao, packed full of succulent and fragrant five spice meat, topped with a sprinkling of spring onion, coriander and peanuts. Super tasty and oh so fresh, a lovely light way to kick off our evening. HomeBoys was founded by Masterchef 2015 finalist Pete Hewitt, with modern Asian inspired street food served from the side of a 1978 Grumman Olson Stepvan. 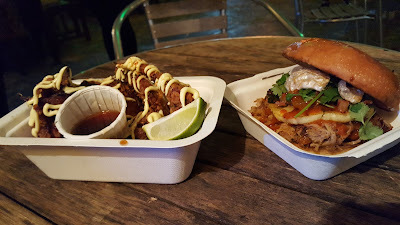 We chose to share the Kara Age chicken wings and the pork sando bun. Kara Age simply refers to the technique of deep frying in oil - these chicken wings were coated in potato starch, for an incredible crisp finish, and were served with Japanese Kewpie mayo. The sando bun was mouth-wateringly good, with the accompaniments of pickled pineapple and kimchi being flavourful and unique. 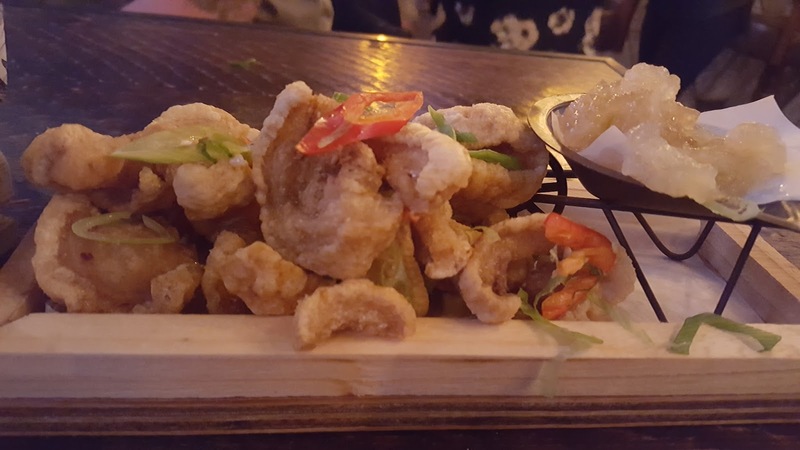 There was also something on top which I forget the exact name of but was described as a "low calorie pork scratching", what more could you ask for in life?! The two together were mega filling and both absolutely outstanding quality. Despite being pretty stuffed already, we couldn't resist trying something with was completely unlike anything we've ever seen at this sort of event. 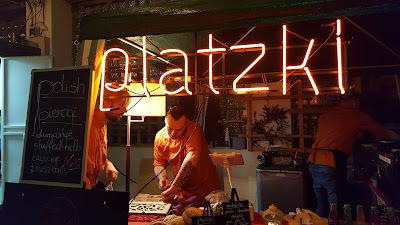 And so our final choice was Platzki - a completely new offering to the street food world. We tried the pierogi (traditional mushroom and cabbage dumplings) and the "classic zap" - a Polish style baguette topped with mushrooms, onions and cheese. It was as long as Laura's forearm AND HAND and was bursting with earthy flavour. 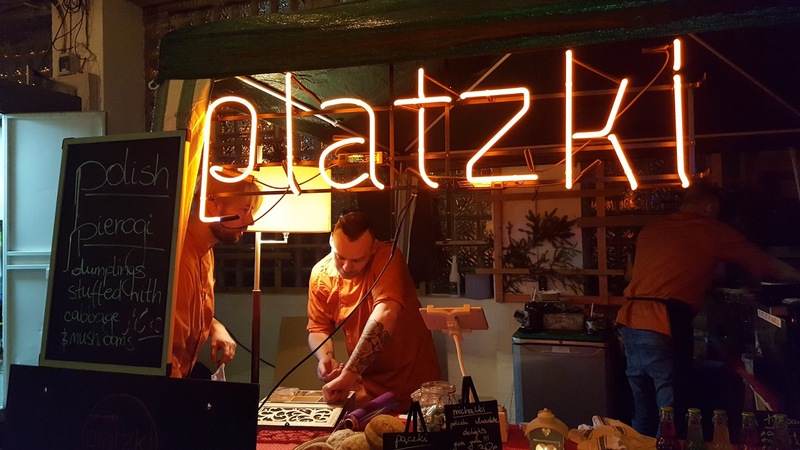 Worth mentioning as well that Peter, one of the three members of the Platzki team, came for a chat with us and is quite frankly fantastic - the most charismatic man in street food! The next Street Food Warehouse event is taking place on February 13th, and we can't recommend it enough. 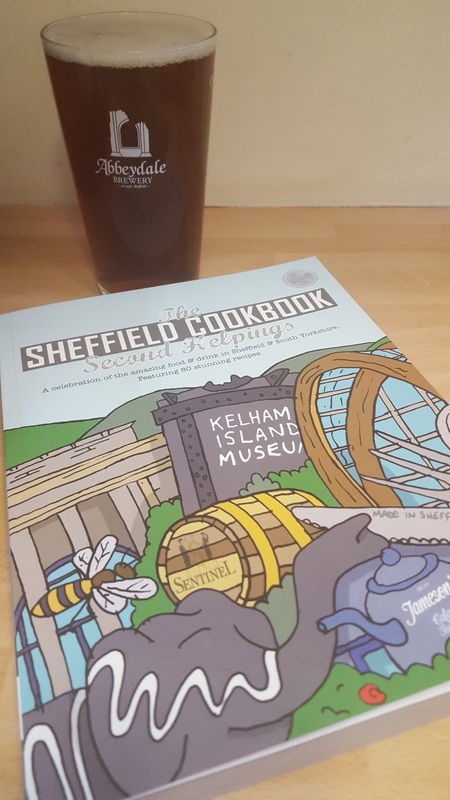 The second release of the Sheffield Cookbook, from Meze Publishing, is out now just in time for Christmas, and a veritable plethora of Sheffield's restaurants, cafe and pubs are showcasing their top recipes within. Now we're big fans of the first book, and have the Nottingham version too, and this second edition is MASSIVE... proof that Sheffield has a thriving and vibrant foodie scene! Being the beery types that we are, one of the things that we first noticed about this book is that Sheffield breweries and pubs are very well represented. Abbeydale Brewery is represented by their pub, The Rising Sun in Nether Green, who's kitchen team have whipped up a rolled lamb breast dish with crispy lamb neck bon bons, using Abbeydale's Daily Bread (we have since been to the Rising Sun to taste this dish and can absolutely vouch for it's deliciousness!). Sentinel Brewery have created a pork and black pudding Scotch egg (which has malt in the coating! 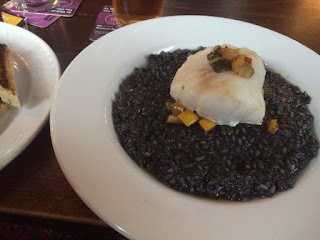 ), served with brown sauce made from brewer's wort - a really interesting way to incorporate beer and the brewing process into food! If you're more of a dessert person, one of our favourite shops, Beer Central, has submitted a chocolate cake recipe using Thornbridge Brewery's sumptuous Cocoa Wonderland stout. Thornbridge's best bitter, Lord Marples, is also represented by the Stag's Head pub (which forms part of the Thornbridge portfolio) who use it as a braising liquor for their venison shank. The recipes are mainly targeted towards pretty ambitious home cooking, but generally use ingredients that are easy to get hold of, making the book perfect for those who like a bit of a challenge in the kitchen. For example, the ham hock ballotine with textures of apple from Thyme Cafe is an excellent mix of simple flavour combinations, incorporating a more technical way of cooking. We're also dying to have a go at one of our absolute favourite dishes - Rico from the Rutland Arms has shared his secrets on how to recreate his INCREDIBLE cod dish, which comprises beautiful roasted fish with arroz nigre (a risotto type dish made with squid ink), braised octopus in garlic and smoked paprika XO emulsion. 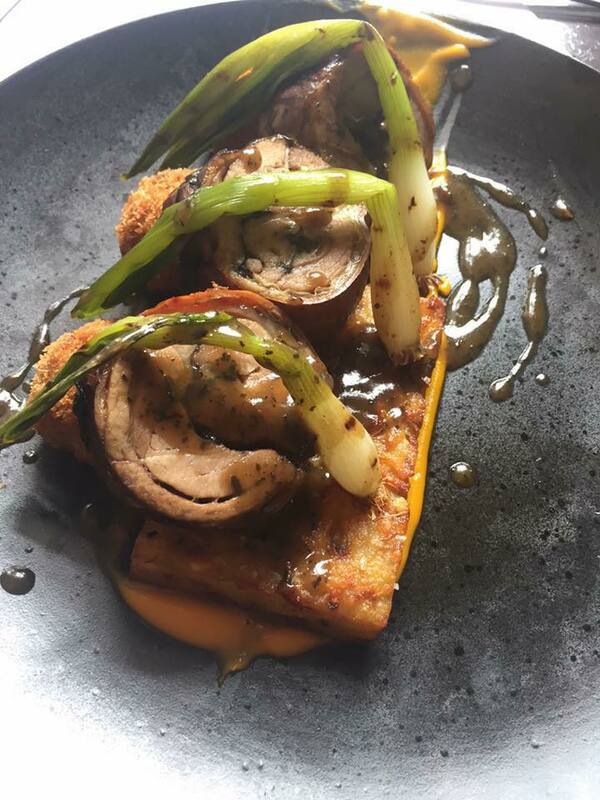 We always make a beeline for the Rutland whenever we spy this on the specials menu, and the recipe is detailed and informative enough that we have confidence we can at least have a go at doing the dish a bit of justice (we will report back in due course!). So much deliciousness in every single one of it's 318 pages. Bravo, Sheffield Cookbook! We're not usually ones to frequent chain establishments, preferring instead to support our local independents, but when we were invited along to the launch night of the newest addition to Sheffield's bar scene, The Botanist, the look of their cocktail menu alone made us decide it was worth making an exception. 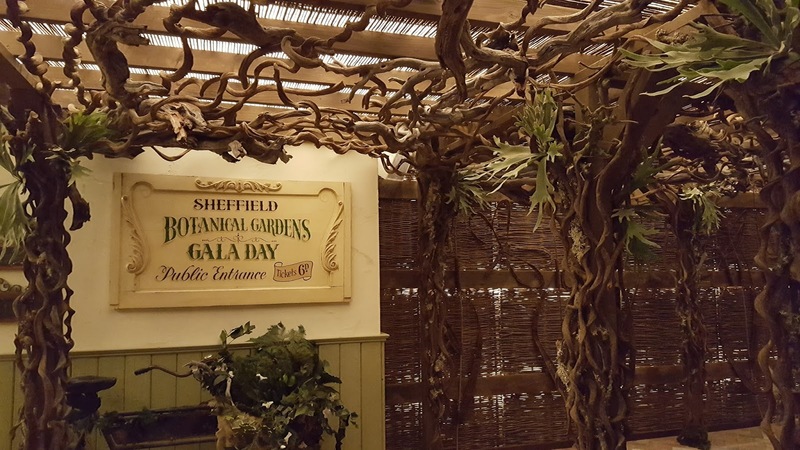 The Sheffield branch of the Botanist is the 10th of it's kind across the UK, run by the New Trading Company, and is based across three floors in fashionable Leopold Square. We received a warm welcome from Ellie and the Botanist team and were ushered straight into the downstairs bar area where Laura dithered over the cocktail menu for far too long, eventually picking the signature "The Botanist" cocktail (vodka, rum and elderflower liqueur) upon the recommendation of the bar staff. Jim went for an All Day IPirinha - a clever twist on a beer cocktail with a miniature caiprinha served alongside a full can of Founders All Day IPA, meaning you could tailor the cocktail to your own exacting requirements. A good idea indeed. 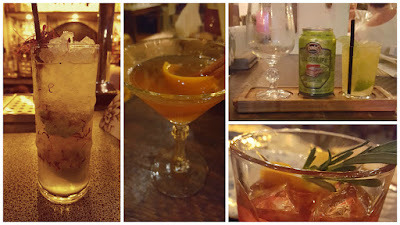 Both were presented beautifully and tasted wonderful, the Botanist getting more savoury than sweet as you continued to sip which was pleasantly surprising. We then went upstairs to be seated. Instantly, the decor absolutely blew us away - it is absolutely stunning. Victoriana blends seamlessly with the floral theme and the entrance to the room, which has been made to resemble a woodland glade, made us feel like we were being transported to somewhere almost ethereal. 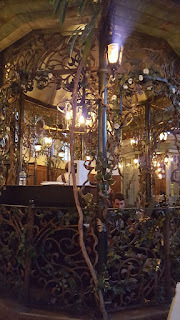 The focal point of the dining room is a little bandstand, where on the night of our visit acoustic musicians added to the relaxed ambience of the room, even making Shaggy sound classy. Who knew this was a thing?! The venue plans to host "Sunday afternoon sessions" with this sort of feel, alongside evening gigs. Onto the food! While we perused the cocktail menu (again), we welcomed a little nibble platter of pork crackling to the table, slightly Asian-inspired with chilli and spring onion (and we think soy sauce provided much of the saltiness), deliciously crunchy and served with sweet apple sauce which cut perfectly through the chilli... and can we all please take a moment to appreciate the tiny wheelbarrow?! Starters arrived swiftly after along with our second cocktails of the evening. The homemade Scotch egg had a lovely runny middle, and came with a piccalli puree - initially a tad perturbing, but absolutely couldn't fault the flavour, tangy and piquant against the well-seasoned sausage meat and egg. The basket of wings was a generous portion, and again served in the most twee (in a good way) fashion in a little wicker picnic basket. The cocktails were just as impressive as the first round - the blackberry and mint julep was refreshing with a good kick from the bourbon, and the rosemary negroni was probably the nicest negroni I've ever had in a bar, with savoury bitterness coupling brilliantly with grapefruit and rosemary. 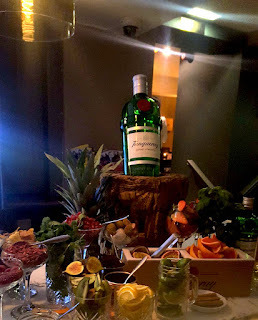 It's worth mentioning that the spirit menu (particularly the gin) is extensive and the emphasis is on using quality, carefully selected options in the cocktails too - no sticking to "house" options here. 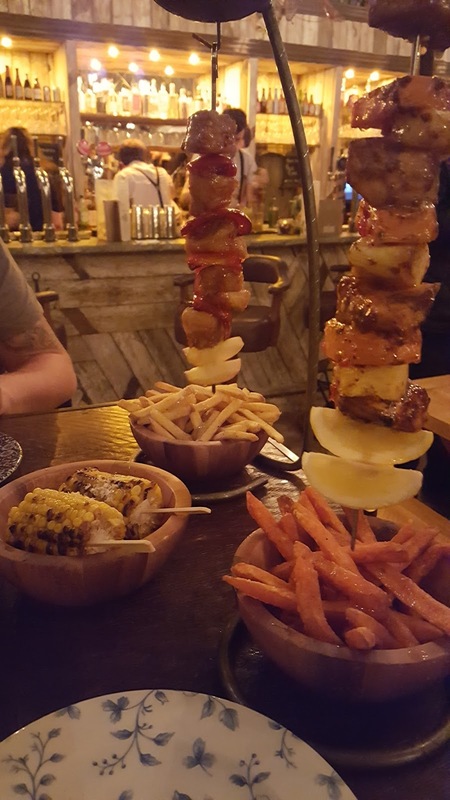 We both picked the "Hanging Kebabs" for main - Laura the jerk salmon with sweet potato fries, and Jim the salt and pepper belly pork with regular fries. When these arrived they looked spectacular, although it would have been good to have been informed that the vegetable component of the salmon kebab was sweet potato (this wasn't specified on the menu), as I'd then have picked a different side. It ended up being far too sweet potato heavy meaning I couldn't finish everything. The salmon was well cooked, though, and the jerk seasoning was spicy without being too overpowering. Jim's belly pork was melt in the mouth, but pretty heavy on the salt. Jim couldn't resist his favourite sticky toffee pudding for dessert, accompanied by a Wild Beer Millionaire, a salted caramel stout which made the rich pudding even more of a treat. Laura decided to refrain, instead choosing a sweeter cocktail to finish off the meal - a pear and cinnamon Sazerac, a well-balanced, slightly festive and imaginative twist on the classic. We had been informed towards the start of the evening that staff training was still underway, with new members of staff shadowing more experienced members of the team. We really appreciated being informed of this - service was a tad reserved in places but having this explanation meant that in no way did we see this as a negative. Overall, a hugely enjoyable evening. Although the main courses weren't quite up to the standard of the starters and nibbles, the lavish but welcoming feel of the venue and the outstanding, elegant cocktails more than made up for it and we'll undoubtedly be back to work our way through more of the menu. Many thanks to the team for having us down! 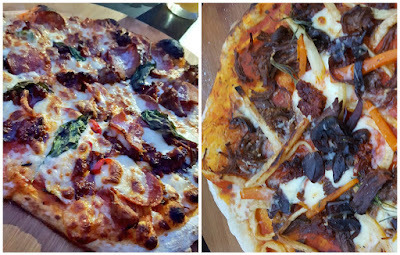 Part of Sheffield's well-respected The Milestone group, Craft & Dough has got tasty pizza nailed. Add to that an improving beer selection and a cracking brunch menu and you're onto a winner. 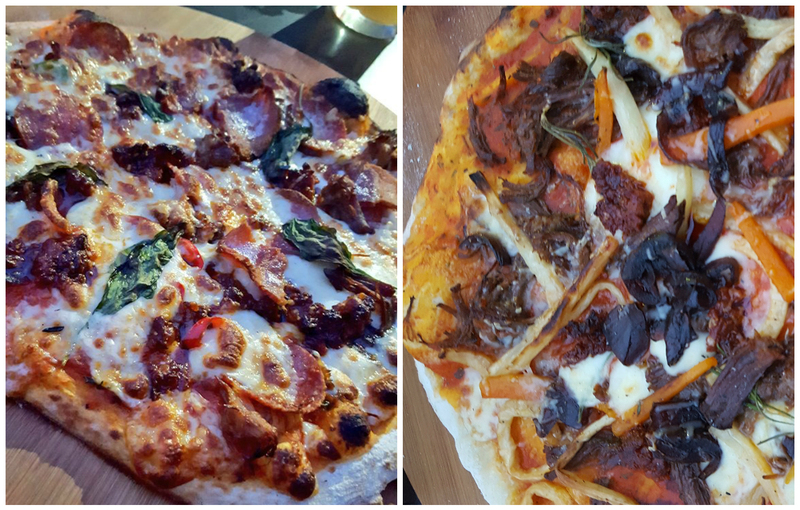 There are three sites across the city, and we were invited along to the Ecclesall Road venue (sure to be massively popular with the incoming student population) for the launch of their Pizza School events. 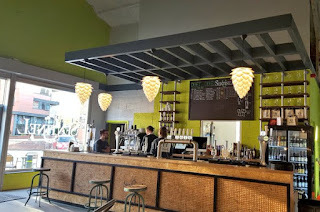 On a balmy Wednesday evening we strolled down and were greeted with a welcome drink, both going for Abbeydale Brewery's Rango Mango, a refreshing mango Berliner Weisse. The event was held in the upstairs space, with 8 of us in attendance - the perfect number, we all agreed, to allow everyone to get fully stuck in and have a good chat with the chef as well as each other. Our tutor for the evening was Jack, who as well as being a top notch pizza master is also a passionate pastry chef, creating all manner of delicious desserts too (which we'll definitely be going back to sample!). After a welcome nibble platter featuring an array of cured meats, fresh bread, and chargrilled artichokes, it was onto the work. After being supplied with a very fetching disposable apron each, we combined our flour, oil, water and yeast (all pre-measured separately for us) and got our hands sticky diving in to create the dough. As soon as the mixture was kneaded enough to form a rough ball, it was time to add the salt, followed by a further ten minutes of kneading, provoking a little competition within the group of who could get the springiest dough! It was then revealed that our dough needed 6 hours to rest, which meant we were able to take our homemade version back with us to use another time (ours is happily sat in the freezer ready for a nice night in!) to be replaced by some that Jack had prepared earlier - to the relief of some of the group! After stretching the dough out into something that vaguely resembled a circle, it was time to add the toppings. We were definitely spoilt for choice - a problem Jim overcame by chucking a bit of everything on. 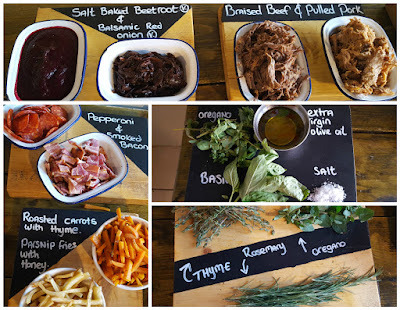 Laura was a tad more selective, going for beef brisket, balsamic onion, and honey roast parsnips with rosemary. Each ingredient had clearly had time and care taken over preparing it, and all meats are sourced locally. 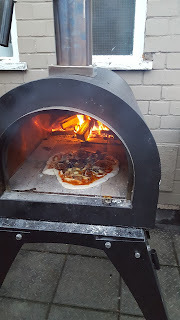 As it was such a lovely evening, we were able to cook our pizzas on the terrace (in bad weather, the larger oven in the main kitchen would be used). 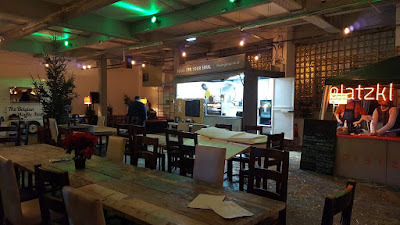 The only downside to this was that the outdoor oven could only cook one pizza at a time, but with a small group we didn't see this as a major problem, particularly as we were all chatting away throughout, thanks to the relaxed atmosphere created to Jack and the team. And the pizzas were definitely worth the wait! Big thanks to Jack and the Craft & Dough team! Beer and food pairing events are more often than not top of our must-do list, and the BBQ Collective are definitely hosting some of the best in Sheffield. 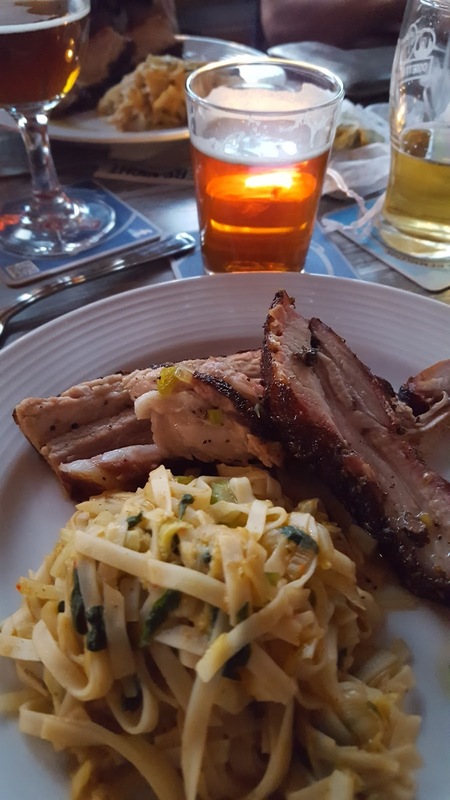 Each month, a different local brewery joins up with BBQ Collective head honchos Jeff and Mat to carefully and collaboratively consider and create a mouthwatering feast where the beer and food work perfectly together. 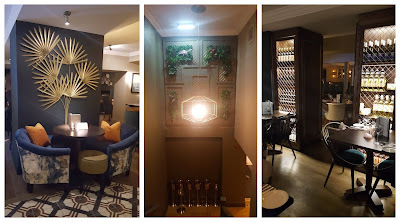 Last month was the turn of one of the newest additions to Sheffield’s beer scene, North Union, based in a railway arch close to the Wicker in the city centre. Head brewer Iain Kenny presided over the proceedings with panache! We kicked off the evening with a starter of rare beef tenderloin on homemade black pepper crispbread, with burrata and smoked tomato relish. The drink to accompany was a wonderful Oatmeal Stout at 4.8%, with a twist of being nitrogenated rather than being fused with Co2. The smaller NO2 bubbles meant the drink was smoother and creamier and slipped down an absolute treat. A very good example of the style. The second course was a green chilli, smoked chicken and sweetcorn chowder served with a chicken skin cracker (we could have eaten a dish of these alone!). Alongside we were given a glass of North Union's core release, the Pale Ale, at 5.5% ABV. 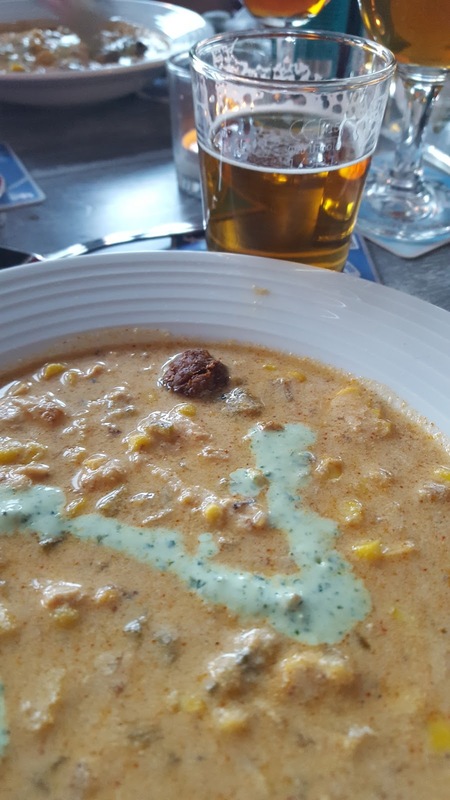 The crisp freshness of the beer paired really well and cut through the creamy chowder. Little hot link meatballs were a spicy, tasty treat in this one too! A little surprise for the third course, as we were all ushered outside with a red cup each, into the sunshine where Iain was waiting with a party keg of his 7% imperial lager, “Shy Bairns Get Nowt”. 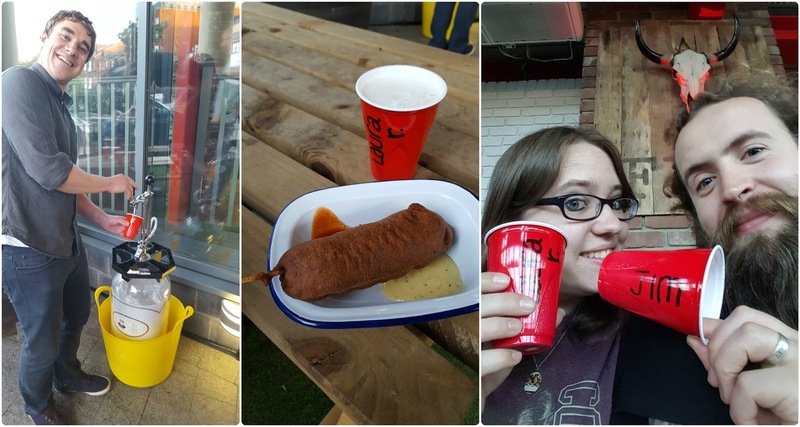 To go with the American house party feel, the food pairing was a corn dog, served with a dollop of homemade smoked ketchup and Alabama mustard sauce. 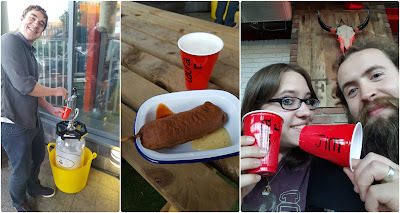 Our first ever corn dogs and they were a veritable revelation. Crispy outer, doughy and indulgent corn bread inside, all wrapping up the BBQ Collective's signature spicy Texas hot link sausage. The beer was a little sweet for the tastes of some of the group, but we both loved it and we reckon it's damn near impossible to find any other beer with a more "Sheffield" name! Smoked pork ribs with a tender delicious pull from the bone were up next, accompanied with Indonesian spices and noodles. While this combination might not be initially the most obvious, the outcome was incredible, and the fresh chilli heat from the noodles seemed to bring more flavour out in the sweet wood smoked meat. To pair, Craft Amber - a refreshing lager at 4.6% with a clean balanced palate and a light floral nose, which worked well to cleanse the palate in between bites and ensured that even though we were four courses in none of the flavours became too heavy. The final course was shots! Dark chocolate and chilli ice cream with cherries, dark Guatemalan rum and the final beer of Dubbel at 6.5%. 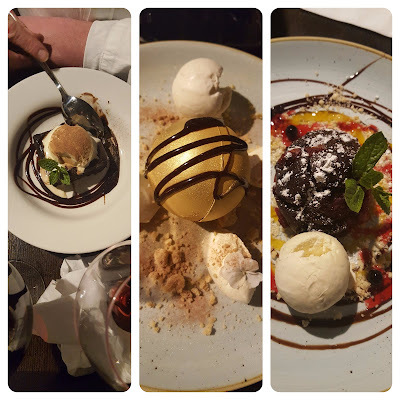 All rich and bold, the flavours of the three glasses complemented each other well, with rich malted roastiness from the beer echoing the chocolate notes in the ice cream, with a great boozy hit from the glass of rum. We'd have liked the ice cream to have been a little firmer (it was served almost as a milkshake) but this is a very minor criticism in what was frankly an ace meal all round. There was one final surprise to come. Beer pong! Laura proved the victor and came home with a case of North Union Pale Ale and a red cup (of course) full of Jeff’s smoked tomatoes, which we had tons of fun experimenting with! 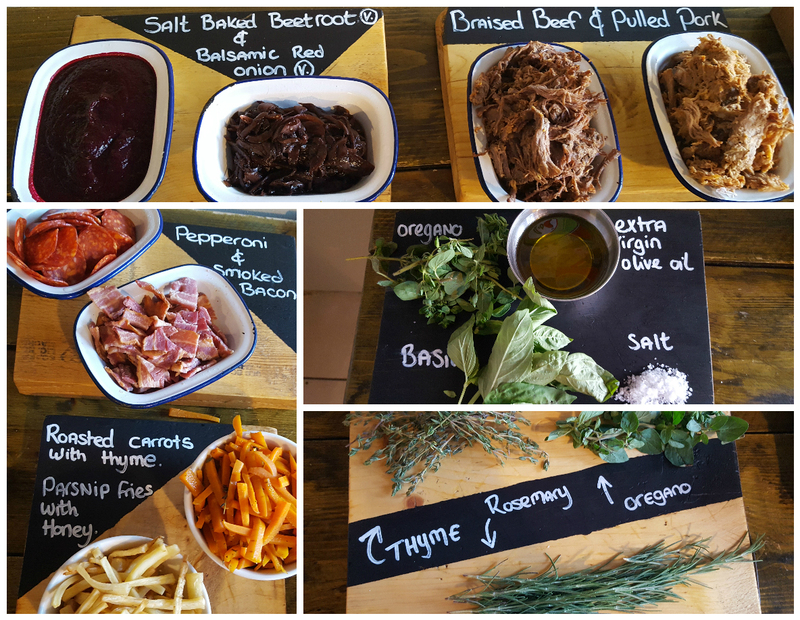 We used them in a Korean influenced BBQ sauce, a slow cooked ox ragu, and a triple tomato bruschetta topping. 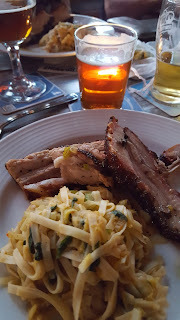 This was the third BBQ and Brewers Night we’ve attended, and it’s great to see that what could have potentially turned into a restrictive theme has just continued to grow, expand, and push the boundaries. Here’s to many more! 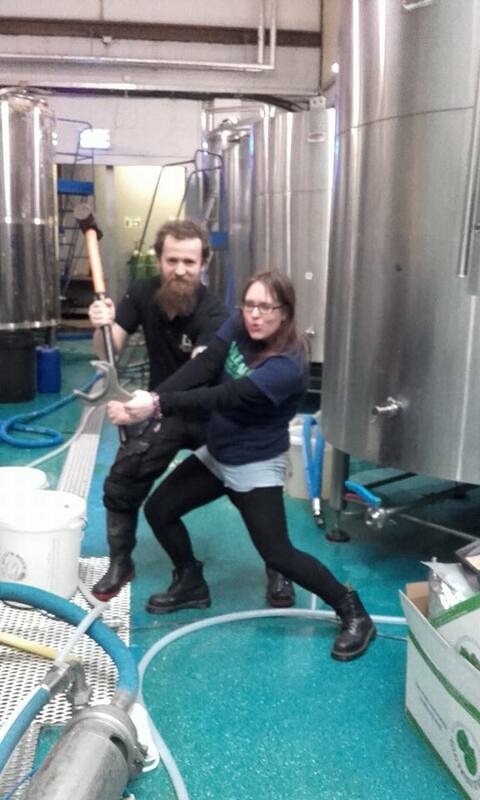 What better way to celebrate Sheffield Beer Week than to brew a beer with some of our Steel City chums! Teaming with Meg and Chris from Karma Citra, we brewed with our day job mates Abbeydale Brewery. We bandied around a few ideas before settling down on a classic oxymoronic beverage - the white stout. While yes, we know stout is just a traditional term for strong, in the current lexicon it is most commonly used as a dark beer descriptor. Made with loads of coffee from local experts Pollards, cocoa nibs for a hit of rich sweetness and heaps of lactose, we aimed to create a beer that when drunk confuses as well as pleases. Chris is life and soul of all parties!